Objective: The objective of this study was to investigate the molecular mechanisms involved in rapamycin-induced inhibition of tumor growth. Materials and Methods: Murine S180 sarcoma cells were subcutaneously injected into mice, and the tumor-bearing mice were randomly divided into three groups (vehicle control, 2 mg/kg rapamycin, and 4 mg/kg rapamycin). The effect of rapamycin on tumor growth was determined by measuring tumor volume. 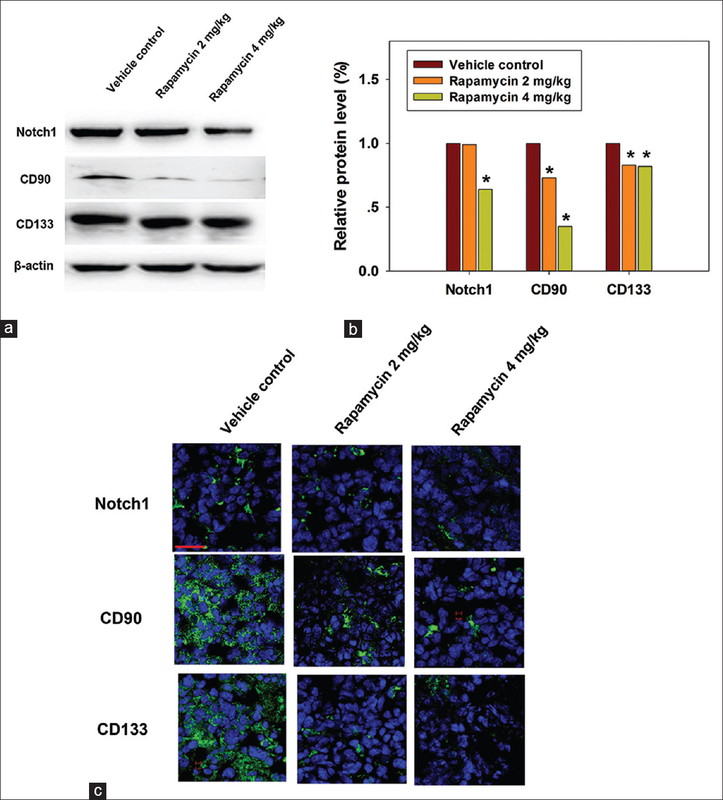 Mammalian target of rapamycin (mTOR), Beclin1, ULK1, LC3, Notch1, CD133, and CD90 expressions was confirmed using confocal microscopy and Western blotting. Results: The tumor growth inhibition rates induced by high-dose and low-dose rapamycin were 48.8% and 30.1%, respectively. Beclin1 and ULK1 expressions and the LC3-II/LC3-I ratio in tumor tissues were altered by rapamycin, whereas mTOR, Notch1, CD133, and CD90 expressions were significantly inhibited by rapamycin in immunofluorescence assays. Western blotting also showed similar results. Conclusion: Tumor growth delay induced by rapamycin may be associated with the suppression of the cancer stem cell phenotype (Notch1, CD133, and CD90) and promotion of autophagy (mTOR, Beclin1, ULK1, and LC3-II/LC3-I ratio) in the murine S180 sarcoma model. Autophagy, initially considered to be a nonselective process of self-eating, is a crucial regulator of cellular homeostasis involved in cell growth control, metabolism, the balance between cell survival and death, and aging. Many factors such as starvation, hypoxia, and oxidative stress induce autophagy. It is related to human disease and health. Rapamycin, a mammalian target of rapamycin (mTOR) inhibitor, is capable of promoting autophagy and shows antiproliferative effects on cancer cells, including leukemia, breast cancer, lung cancer, and kidney cancer. It is intricately linked to apoptosis, proliferation, invasion, and angiogenesis in some tumors.,, Therefore, administration of rapamycin combined with other antitumor drugs can potentially enhance the antiproliferative effect of the drugs. Cancer is a leading cause of death globally and in China. Cancer treatments include surgery, chemotherapy, and radiotherapy; however, the effectiveness of conventional chemotherapy and molecularly targeted therapies is limited due to cancer stem cells (CSCs). CSCs, which rarely exist in tumor tissues, have stem cell properties and play an important role in sustaining tumor formation, local recurrence, metastasis, and drug resistance. Certainly, great efforts are required to develop novel strategies that target CSCs with higher efficiency and fewer side effects. In this study, we investigated the antiproliferative effect and mechanism of rapamycin on the murine S180 sarcoma model. Our data revealed that rapamycin delayed tumor growth in vivo and that the antiproliferative mechanism may be associated with CSC phenotype suppression and autophagy promotion in the murine S180 sarcoma model. In brief, our research suggests that rapamycin may provide a strategy to treat sarcomas. Rapamycin, obtained from Rubio (Saxony, Germany), was dispersed in saline and stored at 4°C. Dulbecco's modified Eagle's medium (DMEM), fetal bovine serum, penicillin, streptomycin, and all other cell culture reagents were obtained from Life Technologies (Grand Island, NY, USA). The murine sarcoma 180 cells were purchased from the Type Culture Collection of the Chinese Academy of Sciences (Shanghai, China). S180 cells were cultured in DMEM supplemented with 100 U/mL of penicillin, 100 μg/mL of streptomycin, and 10% fetal bovine serum at 37°C in a humidified atmosphere containing 5% CO2. Five-week-old male Institute of Cancer Research (ICR) mice were purchased from Vital River Research Animal Services (Beijing, China) and housed under pathogen-free conditions. This study was carried out following the recommendations from the Guide for the Care and Use of Laboratory Animals by the National Institutes of Health. The protocol was approved by the Committee on the Ethics of Animal Experimentation at the Second Hospital of Shandong University. After being fed in our laboratory for 1 week, mice were intraperitoneally injected with S180 cells. All mice were subcutaneously injected with 1 × 107 ascites cells/mouse on the right flank. When the tumor grew to about 50–100 mm3, all tumor-bearing mice were randomly divided into three groups as follows: vehicle control group, 2 mg/kg rapamycin treatment group, and 4 mg/kg rapamycin treatment group. Each group contained 7–8 mice. Rapamycin was dispersed in saline. The mice were treated every day for 14 days through oral gavage administration of vehicle control, rapamycin at low dose (2 mg/kg), and rapamycin at high dose (4 mg/kg). To check the toxicity of the rapamycin treatment, the animals were weighed every other day. The tumor volume was also measured every other day using a linear caliper. Tumor volume was determined using the following formula: V = W2 × L × 0.5, in which W and L are the perpendicular small and large tumor diameters, respectively. Body weight of the mice was measured every 2 days, and the experiment lasted 3 weeks. Mice were euthanized 24 h after the last treatment, and then, retro-orbital blood was collected and the tumors were dissected and weighed. Tumor inhibitory rate was determined using the following formula: inhibitory rate = (average tumor weight of the vehicle control group [g]−average tumor weight of the rapamycin treatment group [g])/average tumor weight of the vehicle control group (g) × 100%. Portions of each tumor were snap frozen in liquid nitrogen and stored at −80°C for protein extraction. Other parts of the tumor were immediately placed into 4% paraformaldehyde and embedded in cryoglue (SLEE Medical GmbH, Germany). Western blot analysis was performed with primary antibodies against mTOR (Cell Signaling Technology, Beverly, MA, USA), Beclin1 (Cell Signaling Technology), ULK1 (Abcam, MA, USA), LC3 (Cell Signaling Technology), Notch1 (Abcam), CD133 (Abcam), CD90 (Abcam), and β-actin (Abcam). The tumor tissue was homogenized with ice-cold lysis buffer (FNN0011, Life Technologies, Inc.) supplemented with protease inhibitor (P2714, Sigma) and 1 mM phenylmethylsulfonyl fluoride. The protein concentration was determined with a bicinchoninic acid assay kit (Bio-Rad Laboratories, Richmond, CA, USA). Proteins (15-30 μg) were loaded for electrophoresis on 10% (w/v) polyacrylamide gels and then electrophoretically transferred to polyvinylidene difluoride membranes (Millipore, MA, USA). The membranes were incubated with primary antibodies, followed by peroxidase-linked secondary antibodies. Proteins were detected with the Luminata™ Forte Western HRP substrate (Millipore) according to the manufacturer's instructions. Band intensity was determined using the ImageJ software (Wayne Rasband, NIH, Bethesda, MD, USA). Tumor tissue was placed in 4% paraformaldehyde in phosphate-buffered saline (PBS). Fixed tumor samples were embedded into paraffin and cut into 4-μm serial sections. Slides were deparaffinized in xylene, cleared in an ethanol series, and the deparaffinized sections were stained with hematoxylin and eosin (H and E) for histological observation. Tumor samples were embedded in cryo glue, stored at −80°C, and sectioned vertically at 10 μm. The sections were blocked for 1 h at room temperature in 5% bovine serum albumin containing 0.5% Triton X-100 in PBS and then incubated overnight at 4 h with primary antibodies diluted in blocking solution. The negative control was incubated in PBS without the primary antibody. Secondary antibodies (goat anti-rabbit IgG) were then added for 60 min to provide immunofluorescence. The nucleus was stained with 4',6-diamidino-2-phenylindole for 15 min. The sections were observed under laser scanning microscopes 780 laser confocal microscope (Zeiss, Germany). All the results were processed using SPSS 17.0 statistical software (SPSS, Inc., Chicago, IL, USA), and the descriptive statistics were presented as means ± standard deviation. one-way ANOVA was performed to compare the means and distributions for the different treatment groups. P < 0.05 was considered to be a statistically significant difference. To evaluate the in vivo effects of rapamycin, we investigated its effects on tumor growth in sarcoma 180 tumor-bearing mice. The experiment was terminated and all mice were sacrificed on day 14. 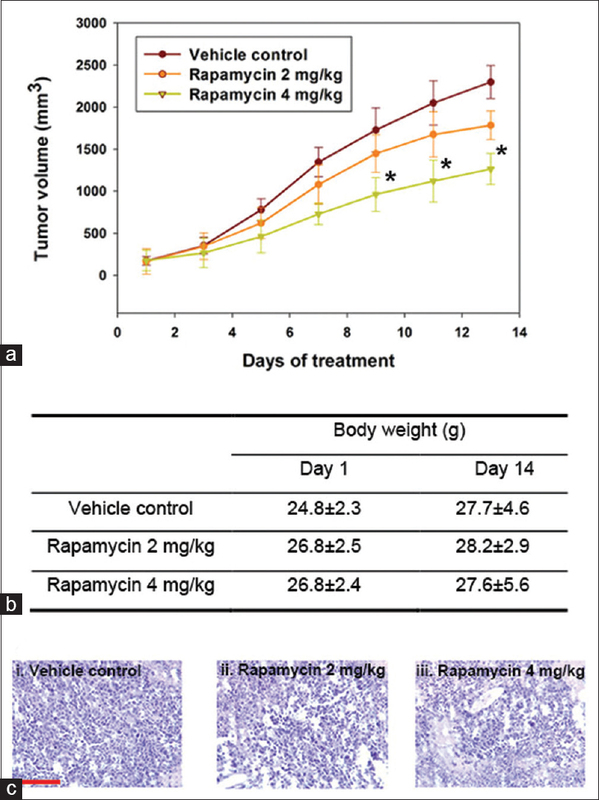 The mean volumes of the subcutaneous tumor in rapamycin-treated mice decreased when compared to the vehicle control. Treatment with rapamycin at low dose (2 mg/kg) caused tumor growth but was not significant when compared to the vehicle control. Contrastingly, tumor growth was significantly inhibited in the group treated with rapamycin at the higher dose [4 mg/kg; [Figure 1]a. On day 14, the mean tumor volume in mice treated with vehicle control was observed to be 2298 mm3, whereas the mean tumor volume in animals treated with rapamycin at 4 mg/kg was 1264 mm3. The tumor growth inhibition rates of the 2 mg/kg and 4 mg/kg rapamycin treatment groups were 30.1% and 48.8%, respectively. The next question to be addressed was whether continuous injection at doses of 2 or 4 mg/kg induced systemic toxicity in tumor-bearing mice. During the injection period, none of the mice treated with rapamycin (both 2 mg/kg and 4 mg/kg) exhibited abnormal behavior in routine activities. The body weights of all the mice were monitored to evaluate the side effects of rapamycin. As shown in [Figure 1]b, no obvious loss in body weight was observed throughout the experiment, indicating that rapamycin did not exhibit evident systemic toxicity at the doses used in our study. We also histologically examined the tumors in S180 tumor-bearing mice. The vehicle control group showed that the sarcoma cells grew irregularly with sheets and nests, and the nucleus of the tumor cells varied in shape and size. As rapamycin dose increased, the 4 mg/kg rapamycin treatment group exhibited more morphological changes with respect to the characteristics of apoptotic tumor cells such as nuclear pyknosis and karyorrhexis when compared to the low-dose group [Figure 1]c.
Previous studies showed that rapamycin inhibited mTOR to induce autophagy. To evaluate its in vivo effect, we examined the autophagy induced by rapamycin using Western blot and confocal microscopy in sarcoma 180 tumor-bearing mice. The expression of autophagy-associated proteins mTOR, Beclin1, and ULK1 and the LC3-II/LC3-I ratio were normalized to β-actin expression through band intensity. Compared to the vehicle control group, ULK1 and Beclin1 protein expression in the two treatment groups increased whereas mTOR protein expression decreased [Figure 2]a and [Figure 2]b. Beclin1, ULK1, and mTOR were expressed in the cytoplasm of tumor cells. 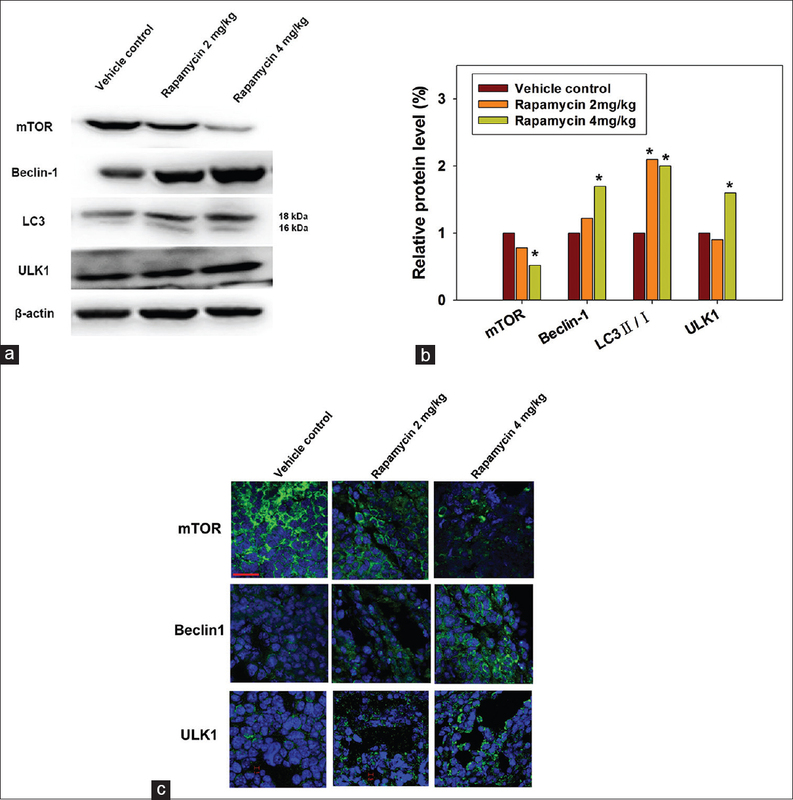 Beclin1 and ULK1 expressions in the vehicle control group were markedly lower than the rapamycin treatment groups, especially the 4 mg/kg dosed group [Figure 2]c. This demonstrates that rapamycin-induced autophagy in a dose-dependent manner. CD90 and CD133 were previously identified as markers for CSCs. Moreover, the Notch signaling pathway crucially regulates the self-renewal and survival of CSCs. To determine whether rapamycin inhibited the CSC phenotype, we quantitatively analyzed Notch1, CD90, and CD133 expressions using Western blots and ImageJ software-mediated band intensity analysis. We observed a dose-dependent decrease of these proteins [Figure 3]a and [Figure 3]b. Notch1, CD90, and CD133 were expressed in the membrane of tumor cells [Figure 3]c. Immunofluorescence staining [Figure 3]c also showed that rapamycin reduced Notch1, CD90, and CD133 expressions in a dose-dependent manner in the tumor. Beclin1 is a necessary molecule for the formation of autophagosomes. It synthesizes other autophagy-associated proteins located in the autophagic vacuole and mediates the formation and maturity of mammalian autophagosomes through this process. Interestingly, Beclin1 has been shown to increase the autophagic death of tumor cells. LC3 is also involved in the formation of autophagosomes and LC3-II content is proportional to the amount of autophagic vacuoles. In addition, ULK1 is a vital protein for autophagosome formation and is directly regulated by mTOR. However, the condition(s) under which the autophagy mechanism promotes cell death and determines cell survival still remains unresolved. In our investigation, rapamycin-induced autophagy at doses of 2 mg/kg and 4 mg/kg in S180 tumor-bearing mice. The Notch signaling pathway is an important tumor stem cell pathway that mainly mediates differentiation signaling. mTOR is a positive regulator of the Notch signaling pathway, which can regulate stem cell numbers. Since rapamycin inhibited tumor growth and promoted autophagy, we hypothesized that it might decrease CSC numbers by downregulating the Notch signaling pathway. Our results showed that rapamycin probably inhibited the Notch signaling pathway through mTOR, thereby decreasing CSC numbers. In brief, our results demonstrated that rapamycin not only induced autophagy but also decreased CSC numbers. mTOR-induced cell differentiation toward proliferation by increasing the expression of the Notch signaling pathway, thereby promoting the occurrence of tumors. Our observations support a model in which the degree of autophagy determines the negative or positive impact on tumor cell survival. In summary, we used the murine S180 tumor-bearing mouse as a model to examine the antiproliferative effects of rapamycin in this investigation. After treatment, rapamycin delayed tumor growth in a dose-dependent manner. Autophagy-mediated tumor growth suppression and CSC phenotype suppression are highly dependent on the dose of rapamycin. Altogether, our results demonstrate the potential use of high-dose rapamycin in combination with other anticancer drugs in clinical cancer treatment. This project was supported by grants from the National Natural Science Foundation of China (no. 81403150, 81303077, 30873408, and 81073102). Wang RC, Levine B. Autophagy in cellular growth control. FEBS Lett 2010;584:1417-26. Galluzzi L, Pietrocola F, Levine B, Kroemer G. Metabolic control of autophagy. Cell 2014;159:1263-76. Baehrecke EH. Autophagy: Dual roles in life and death? Nat Rev Mol Cell Biol 2005;6:505-10. Mizushima N, Levine B, Cuervo AM, Klionsky DJ. Autophagy fights disease through cellular self-digestion. Nature 2008;451:1069-75. Zhao YM, Zhou Q, Xu Y, Lai XY, Huang H. Antiproliferative effect of rapamycin on human T-cell leukemia cell line Jurkat by cell cycle arrest and telomerase inhibition. Acta Pharmacol Sin 2008;29:481-8. Chang SB, Miron P, Miron A, Iglehart JD. Rapamycin inhibits proliferation of estrogen-receptor-positive breast cancer cells. J Surg Res 2007;138:37-44. Boffa DJ, Luan F, Thomas D, Yang H, Sharma VK, Lagman M, et al. Rapamycin inhibits the growth and metastatic progression of non-small cell lung cancer. Clin Cancer Res 2004;10:293-300. Fechner G, Classen K, Schmidt D, Hauser S, Müller SC. Rapamycin inhibits in vitro growth and release of angiogenetic factors in human bladder cancer. Urology 2009;73:665-8. Hansel DE, Platt E, Orloff M, Harwalker J, Sethu S, Hicks JL, et al. Mammalian target of rapamycin (mTOR) regulates cellular proliferation and tumor growth in urothelial carcinoma. Am J Pathol 2010;176:3062-72. Schlosshauer PW, Li W, Lin KT, Chan JL, Wang LH. Rapamycin by itself and additively in combination with carboplatin inhibits the growth of ovarian cancer cells. Gynecol Oncol 2009;114:516-22. Zhang JF, Liu JJ, Lu MQ, Cai CJ, Yang Y, Li H, et al. Rapamycin inhibits cell growth by induction of apoptosis on hepatocellular carcinoma cells in vitro. Transpl Immunol 2007;17:162-8. Wahl GM. BS1-1: Stem cells, cancer, and cancer stem cells. Cancer Res 2011;71 24 Suppl:BS1-1. Yang ZF, Ho DW, Ng MN, Lau CK, Yu WC, Ngai P, et al. Significance of CD90+cancer stem cells in human liver cancer. Cancer Cell 2008;13:153-66. Wang J, Sullenger BA, Rich JN. Notch signaling in cancer stem cells. Oxyg Transp Tissue XXXIII 2012;727:174-85. Levine B, Kroemer G. Autophagy in the pathogenesis of disease. Cell 2008;132:27-42. Shintani T, Klionsky DJ. Autophagy in health and disease: A double-edged sword. Science 2004;306:990-5. Ojha R, Ishaq M, Singh SK. Caspase-mediated crosstalk between autophagy and apoptosis: Mutual adjustment or matter of dominance. J Cancer Res Ther 2015;11:514-24. Hay N, Sonenberg N. Upstream and downstream of mTOR. Genes Dev 2004;18:1926-45. Ahn CH, Jeong EG, Lee JW, Kim MS, Kim SH, Kim SS, et al. Expression of beclin-1, an autophagy-related protein, in gastric and colorectal cancers. APMIS 2007;115:1344-9. Kabeya Y, Mizushima N, Ueno T, Yamamoto A, Kirisako T, Noda T, et al. LC3, a mammalian homologue of yeast Apg8p, is localized in autophagosome membranes after processing. EMBO J 2000;19:5720-8. Debnath J, Baehrecke EH, Kroemer G. Does autophagy contribute to cell death? Autophagy 2005;1:66-74. Androutsellis-Theotokis A, Leker RR, Soldner F, Hoeppner DJ, Ravin R, Poser SW, et al. Notch signalling regulates stem cell numbers in vitro and in vivo. Nature 2006;442:823-6. Ma J, Meng Y, Kwiatkowski DJ, Chen X, Peng H, Sun Q, et al. Mammalian target of rapamycin regulates murine and human cell differentiation through STAT3/p63/Jagged/Notch cascade. J Clin Invest 2010;120:103-14.